We are constantly bombarded with images and messages about what is beautiful. If we wear this clothing, or have that hair, or fit a certain body type – then, then we will be considered beautiful. That “beauty” is both fleeting and subjective. Fashion and trends come and go, and external beauty is in the eye of the beholder. However, the beauty that lasts and matters most to God, is the sort that is developed and upheld in our hearts. When we seek after Him, and are in step with our Savior, a gracious, and settled spirit emerges from us wherever we go. People are drawn to this sort of beauty that lasts. Our hearts, in which the Lord delights, are what attract others to draw near. Interestingly enough, the most beautiful people I know have hearts after God, and what is on the inside overflows to that which is seen. May we invest in adorning ourselves with the lasting beauty of His goodness and grace, as we go forth in the gentleness and quietness of a spirit that is set secure on our Savior. When time puts to test. Dear Heavenly Father, thank You that You are not so interested in how we adorn the external, but rather how we invest our hearts in You. Thank You that as we seek You and trust You, You create a beauty from within. You place in us a gracious and quiet spirit, that is secure in whom You have created us to be. Forgive us for our insecurities that cause our focus to shift to the external rather than within. Teach us to prioritize our focus on the beauty of our hearts according to Your standards, rather than the external according to the world. Show us how to love those around us with gracious and gentle spirits, so that we would be quick to recognize the beauty in those around us. May many come into a lasting relationship with You. Be glorified O God, as we seek to adorn ourselves with beautiful hearts. Amen. This entry was posted in Awe, Beauty, Blessing, Comfort, Courage, Faith, Fear, Forgiveness, Freedom, Gentleness, Grace, Gratitude, Hope, Humility, Kindness, Love, Obedience, Peace, Poetry, Possibilities, Praise, Purpose, Strength, Surrender, Trust, Voice, Worship and tagged 1 Peter 3, adored, adornment, attract, beautiful, beauty, bombarded, cease, choose, clothe, considered, delights, developed, draw near, drawn, emerges, eye of the beholder, fit, fleeting, forgive, gentle, glorified, go forth, God, goodness, grace, gracious, hears, hearts, images, in step, inside, invest, lasting, lasts, laughter, light, Lord, love, matters, messages, near, overflows, precious, quiet spirit, real you, Savior, seek, seen, set secure, show, subjective, teach, test, trust, unfading, upheld, wear, within, without fear. Bookmark the permalink. Jesus was making a comparison between Christians and salt. Just as salt flavors and preserves food, those who believe and follow Him, are called to flavor and preserve His goodness and grace unto the world. 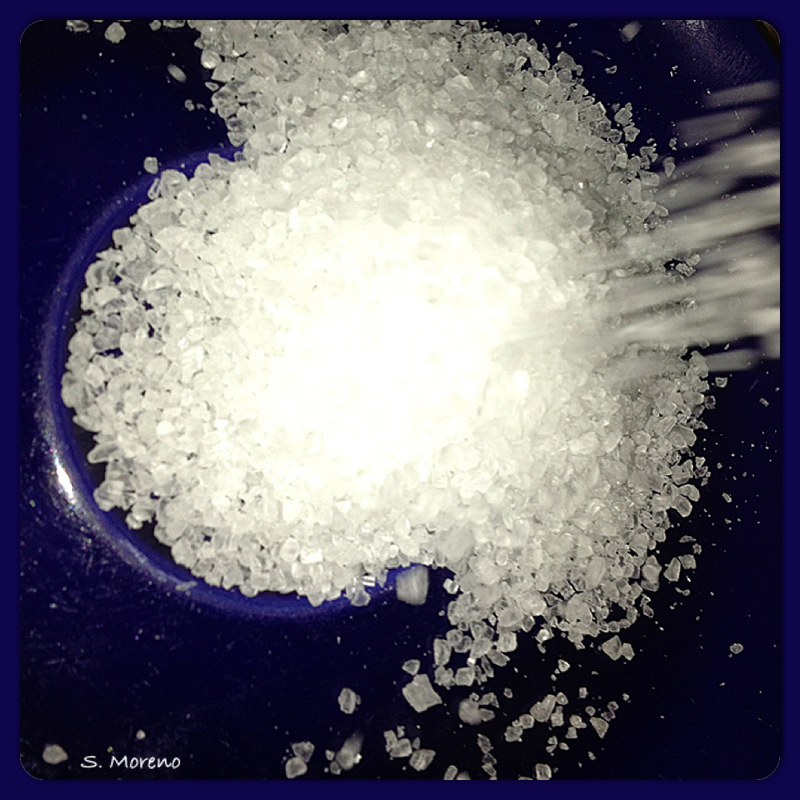 Salt has a distinct flavor and is easily identifiable unless it has lost its saltiness. We too are called to be distinctly different from the world. Our commitment to following Christ should flavor all that we say and do, and therefore be evident to all whom we encounter. May our lives season our surroundings with the grace and goodness of Christ. Dear Heavenly Father, thank You that You call us to flavor and preserve Your good in the world. Thank You that You do not ask nor expect us to do this on our own, but rather You give us Your Holy Spirit to guide, direct, equip and empower us to do all that You are asking. Forgive us for the times that we have blended in with the world, rather than stood up for You as we should have. Teach us to trust You more, so that we will be strong and courageous, trusting You in every circumstance to direct our steps to take the position to which we are called. Lead us to love others as You unfailingly love each of us. May many come into a lasting relationship with You, as they recognize the magnitude of Your sacrifice. Be exalted O God, as we seek to season our surroundings with Your goodness and grace. Amen. This entry was posted in Awe, Blessing, Comfort, Courage, Faith, Forgiveness, Gentleness, Grace, Gratitude, Hope, Kindness, Love, Mercy, Obedience, Poetry, Possibilities, Praise, Purpose, Sacrifice, Serve, Strength, Surrender, Trust, Voice, Worship and tagged asking, believe, Christ, Christians, come, commitment, comparison, courageous, deeds, direct, distinct, distinctly different, easily identifiable, empower, encounter, equip, evident, exalted, fit, flavors, follow, following, forgive, glory divine, good, goodness, grace, guiding, hear, Holy Spirit, Jesus, lead, life, light, love, Luke 14, preserves, recognize, sacrifice, salt, season, seasoned, seeking, seen, strong, surroundings, teach, tender mercy, thrown out, trust, trusting, upright, words, world. Bookmark the permalink.